Protesters, some of them Dumagats, raise their hands while shouting slogans during a rally outside the Chinese Consulate in Makati city, east of Manila, to protest China's role in the construction of at least two large dams in the country, March 14, 2018. Millions of people in Metro Manila were left without water last week, raising pressure on indigenous communities in the mountains above the Philippines capital as the government seeks to tap their terrain for supply. Residents were forced to queue at fire hydrants, and businesses reliant on water, not least laundrettes, closed or suspended operations. Public ire is being leveled at Manila Water, the private concessionary contracted in 1997 to manage water and wastewater services to the eastern area of Metro Manila on a 25-year lease. Civil society groups have accused the company, which is majority owned by venerable Philippines conglomerate Ayala Corp., and invested by the United Kingdom’s United Utilities and Japan’s Mitsubishi Corp., of putting profits before its public service obligations. Manila Water’s failure to secure the city’s water supply has also sparked criticism from legislators demanding that the Metropolitan Waterworks and Sewerage System (MWSS), the agency charged with administering the privatization of the capital’s water systems, penalize the company, and refund consumers. Manila Water blamed the crisis on unexpected demand from the construction industry, shortages in the primary water source, the Angat-Ipo-La Mesa system, and delays to infrastructure projects designed to bring additional supply onstream. The latter includes a series of dams in the nearby Sierra Madre mountains, known as the New Centennial Water Source – Kaliwa Dam Project, which have been mooted as a solution to Metro Manila’s water requirements since the reign of Ferdinand Marcos. The project in its entirety comprises three dams that together will add 2,400 million liters per day (MLD) to the existing 4,000 MLD supply that serves the 20 million or so people in Manila and its surrounding regions. According to the MWSS, the initial phase is slated to begin with a 60-meter concrete dam at Kaliwa, which straddles the boundary of Rizal and Quezon provinces to the east of Manila, as well as a 25-kilometer conveyance tunnel, and two water treatment plants. If built, the Kaliwa dam would bring an additional 600 MLD per day onstream, in the process securing Manila’s water supply for the next 10 to 15 years, MWSS official Byron Carbon said. 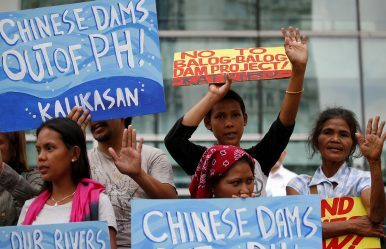 The dam falls under the Philippines’ involvement in China’s Belt and Road Initiative (BRI), and is listed in provisions released following the state visit of Chinese President Xi Jinping to Manila in November last year. Government officials, including MWSS Administrator Reynaldo Velasco and Finance Secretary Carlos Dominguez III, have come out in support of the Kaliwa project, with the former calling it a “done deal” last week. “The agency is working on the Environmental Impact Assessment (EIA) now, the road right of way has been secured, and the Department of Public Works and Highways is reviewing the design of the dam,” Carbon told The Diplomat, adding that the target date for completion of the project is 2023. China Energy Engineering Corp, the company responsible for building the Three Gorges dam in China, has been contracted to construct the Kaliwa dams, but the contract remain under wraps, despite ongoing attempts by activists to have details released to the public. Various nongovernmental organizations oppose Kaliwa on grounds it will lead to environmental destruction and the displacement of indigenous peoples in more than 230 hectares of the REINA National Park, Wildlife Sanctuary, and Game Preserve, a mountainous area of dipterocarp forests. The land is owned by the Dumagats and Remontados indigenous peoples under a Certificate of Ancestral Domain Title. Their communities have fire-fallow farmed the region for generations, or “time immemorial” as specified by the Indigenous People’s Rights Act of 1997, which supposedly guarantees their land rights. A Japanese International Cooperation Agency EIA conducted for the project in the early 2000s identified rare species of flora and fauna in the area, including several species of rattan, a valuable palm used in the manufacture of furniture and balls used in the kick volleyball game Sepak takraw. White-winged flying fox, slender-tailed cloud rat, civet cats, wild boar, and the Philippine eagle and Philippine deer are among the threatened wildlife species in the area. The EIA also outlines a full resettlement plan for the displaced communities within the affected barangays. It notes impacts including the inundation of Dumagat livelihood areas and sacred places of worship, many of which lie adjacent to the river, as well as disruption to the use of the river for transport. Exactly how many indigenous people stand to be flooded, displaced, or otherwise adversely affected is subject to several estimates, ranging from the 42 families identified in a 2017 MWSS feasibility study to the 20,000 people labelled as at risk by a local NGO, the Center for Environmental Concerns–Philippines. In theory, the Kaliwa project still requires free, informed, and prior consent (FICP) approvals from the National Council of Indigenous Peoples (NCIP), the body charged with representing the plethora of indigenous groups in the Philippines. Last week, I travelled with the National Council of Churches in the Philippines (NCCP) to visit the Dumagat community that will be flooded if the second of the Kaliwa project’s three dams is ever built. The NCCP group was conducting outreach work as an initial step to forming a community-based health program that might prevent a repeat of a devastating outbreak of measles in July last year that left 20 people dead. In a hall that doubles as a school for elementary children, about 40 members of the Dumagat community settled to listen to talks on the systemic causes of their exclusion from the Philippines healthcare system, and what they could do to identify and prevent diseases like tuberculosis. Wilma Quierrez Valiente, from the Dumagat community of Quezon, is a member of the Protect Sierra Madre group that works to strengthen the bonds of the community against the threat to their way of life the dam poses. Many Dumagat communities lie several hours away from the nearest health station or school in the barangay centers, travel to which becomes impossible when a family falls sick or children grow into familial responsibilities. The community is braced for attempts to have them sign away their right to the land under the FIPC rules. Elsewhere, communities had reportedly been duped into signing an FICP under the guise of registering attendance at a food distribution program. With the aid of a translator from the Integrated Development Program for Indigenous People, an NGO, I spoke with three tribal elders who collectively represent almost 200 families set to be affected by the dam, both upstream and downstream of the proposed construction area. They said the fencing off of the dam site will tear a hole through their community as the river itself is their primary roadway. They remain uninformed about the project proposal, in part because the NCIP has stalled on accepting their proposed council representative, Germino Mendoza. As a result, they have collectively decided to boycott meetings with the MWSS until further notice, and said categorically that they will not accept another NCIP candidate. While the Dumagats appear united, an elder from Bagong Nayon in Rizal told the audience in the community hall that attempts are being made to split the community with cash incentives. The elder then warned of the perils of city life and declared he would rather die than give up his land. As dusk fell outside the hall, four soldiers from the Philippine Army stopped by to rest their rifles. Their presence clearly made the Dumagats uneasy. The elders said that the military regularly patrolled their lands, ostensibly in a bid to counter the National People’s Army (NPA), the outlawed armed wing of the Communist insurgency. In February, an NPA-affiliated group did claim responsibility for the destruction of three excavators and a digger in protest at unauthorized construction work related to the dam project on Dumagat land. Father Alex Bercasio, a Redemptorist priest who chairs the Protect Sierra Madre group, said Dumagat elders feared a repeat of intimidation tactics that they claim led to the death by heart attack of elder Alan Buenodicio on May 2, 2016. A rotating cast of military personnel had allegedly forced him to drink whisky every morning because he refused to yield his community’s claim to the land. Meanwhile, construction on the access roads from the Marcos Highway to the dam site is well under way. Diggers and cement mixers are slowly moving in, laying the foundation for construction vehicles and trucks should the dam get the go ahead. The darkness of the situation is deepened by the fact that there are several viable alternatives to Kaliwa on offer. Sonny Africa, executive director of the IBON Foundation, an NGO providing research, information and education services to people’s movements in the Philippines, said that the rehabilitation of the Angat dam, coupled with the potential of a revitalization project on the Wawa River, and the opening of new supplies from Laguna Lake, the Philippines’ largest body of fresh water, could negate the need for construction at Kaliwa. Moreover, Osaka-based Global Utility Development Corp. last week let it be known that they had made an unsolicited bid to finance and build a far less environmentally impactful seven-meter dam at Kaliwa, only to have their proposal rebuffed. Brian Eyler, director of the Stimson Center’s Southeast Asia program, said that China’s deepening of BRI is resulting in an increase of policy projects designed to meet political goals. Other deals included in the Philippines’ commitment to the BRI include the completion of the Chico River Pump Irrigation Project, the first initiative under President Rodrigo Duterte’s flagship “Build Build Build” infrastructure program to be funded by China. While the majority of Overseas Development Aid (ODA) to the Philippines is supplied by Japan, China is viewed as critical to the success of Duterte’s Build program, in part because of a massive projected shortfall in the number of Filipino construction workers required to complete its 75 projects, not to mention their combined price tag of 9 trillion Philippine pesos ($171 billion). As is the norm with the BRI, construction of the projects, including the Kaliwa dam, will primarily be undertaken by Chinese workers, and funded by soft policy bank loans. The joint statement following the Duterte-Xi summit promised “complete transparency” as regards both sides’ involvement in BRI projects, yet neither the terms of the loan nor the construction contract for Kaliwa have yet been made public. Under a November 20, 2018, loan finance agreement between the Export-Import Bank of China and the MWSS seen by The Diplomat, the Chinese policy bank will make available a loan facility of up to $211.2 million, equivalent to 85 percent of the contracted cost of the dams, at an interest rate of 2 percent, provided key provisions are met. It remains to be seen whether and how the FIPC approvals from the Dumagat community, whose land the project will scar, will be secured. *A previous version of this article misstated the two dams that would use the conveyance tunnel. David Green is a freelance journalist based in Taipei. Follow him on Twitter @DavidPeterGreen. Analyzing the economic yields from President Duterte’s Chinese rapprochement.